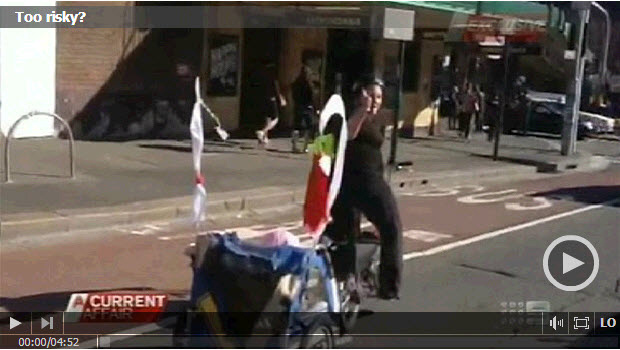 Footage of an Aussie mum towing her baby daughter behind her bicycle on a busy road has shocked police and road safety experts. They say it is irresponsible and downright dangerous. You be the judge. I have previously written about cyclist shaming on Australian television. But cyclist shaming is a product of a whole culture, not just of one TV program. In his discussion of the program, Alan Davies notes that the woman in the clip had sought advice after being filmed, worried that her job as a pre-school teacher might be threatened if she’s portrayed as someone who can’t look after her own child. Unless pre-schools collude with Channel Nine, which is unreasonable to assume and we won’t, Australia has a whole-of-culture problem. It is a bullying approach to governance, which understands democracy as the rule of the mighty, and the art of governing in democracy as one of, basically, damage control. Instead of seeing democracy as a system in which everyone should have equal opportunities to flourish, it sees democracy as a system in which the powerful rule, and the weaker need to be forced out of their way, preferably by enforced laws. It has been applied to everyone at some point, because most of us are a part of some disadvantaged minority, and all of them were, at some point, told to get out of someone else’s way, or else: women, children, darker people, people of other religions, gay and trans people, people with disabilities, elderly people, and so on. This video comes very close to summarising everything that is wrong with present-day, present-time Australia. From the fact that helmets for such small babies don’t exist, via the casual sexism of mother-shaming, to the very fact that this made it to the TV news. It is also an excellent example of that insidious, mean streak in the Australian character that blames the weakest and the most vulnerable user of a public asset (in this case, road) whenever the said weakest and the most vulnerable user faces serious danger. It not only enforces uniformity, it also prevents any discussion of how things could be improved. (The same logic of the ‘no excuse zone‘ concept.) I cannot stress this enough: it is not the absence of helmet that injures cyclists, it is car drivers. But, enough talk. One video is worth a million words, so let’s instead watch some discussion of cycling in Europe, esp re children on board. I must warn you: the above video contains much distressing footage of children on bikes, many of which without helmets. It is shocking and absolutely outrageous, and all those parents should be fined, their children taken away, and sent to Australia… yeah.